SunGate is a professional design, installation, and service company that provides a wide range of solar power solutions. We are committed to improving conditions in South Sudan through the delivery of sustainable solar energy for private, public, and commercial customers. We provide training and apprenticeship opportunities to individuals in the communities we serve to help staff our projects, build up the capacity of the communities to maintain the installed systems, and improve economic conditions through job growth. SunGate is owned and operated by South Sudanese, with investment and management support from the United States. SunGate Solar aims to be the largest provider of solar energy solutions for individuals, homes, offices, and commercial consumers of electricity in South Sudan. We contribute to the advancement of the country through the delivery of clean and affordable electricity and by championing the cause of sustainable energy for all demographics in the communities we serve. The Company expects to grow to impact the lives and livelihoods of the South Sudanese by serving over 1 million people within 10 years. Based in Wau, the company was started in 2013 by founder (Mou Riiny) and US-based NGO (Village Help for South Sudan) with additional technical support by IEEE (Institute of Electrical and Electronics Engineers). In 2015, SunGate Solar formed and registered in South Sudan as a commercial, for-profit venture. SunGate Solar receives financial and management support from SunGate Solar Holdings LLC based in USA (Acton, MA). SunGate’s main offices are in Wau and Juba, and we operate in the regions around Wau, Aweil, and Juba. Serving more than 2000 customers, SunGate has sold over 110 kiloWatts of solar power. Our electricity has supported over 13,000 people with solar solutions of all sizes. By the end of 2017 our solutions delivery success included more than 25 large commercial systems. We have 30 employees currently on our staff. SunGate is continuing to innovate and invest in new solar solutions and expand to other locations in South Sudan. SunGate expects to grow to over 50,000 people impacted within 2 years, with the goal of serving over 1 million people within 10 years. SunGate has sold over 2,000 small, portable units and more than 25 commercial systems in South Sudan since 2013. Our company has been in South Sudan for five years and is here to stay. We use only American, German and carefully examined Chinese solar equipment manufacturers. SunGate is American backed, and the CEO is a South Sudanese citizen with an Electrical Engineering degree from an American university. Our headquarters are in Wau with 6 offices across the country, including Juba. The company employs a large local staff, including: technicians and administrative / sales personnel. We have sold and installed more than 110 KW of solar power and served thousands of customers across the country. Our technicians provide maintenance service for systems we install and those installed by other companies. We provide a generous warranty. We take quality service seriously. Let us prove it to you! Solar Power is more reliable than diesel generators and cheaper over time. Solar energy protects the environment. Solar is cleaner and healthier for your home and family. South Sudan has an abundance of sunlight to provide ample energy for any size system. Once your solar power system is installed, it will provide reliable energy for a long time with low maintenance costs. Mou Riiny was educated in the United States, where he received his degree in Electrical Engineering from the University of San Diego in 2011. After graduating, Mou returned to South Sudan where he worked for a non-profit organization to lead a program building schools and installing several village-level solar energy solutions for community facilities in remote locations. In 2013 he founded SunGate Solar and serves as our CEO. Mou is married and lives with his wife and son in Wau. Gwolo is SunGate’s Project Manager for Portable and PAYG Solutions. 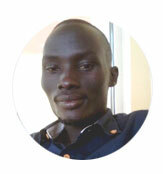 Before he joined SunGate, he was a team leader, sales field trainer, and countrywide sales coordinator with a major telecom company in South Sudan. He holds a Diploma in Business Administration from Kampala and a Certificate in Business Administration from Southern University. Lodoumoe is our Financial Controller. Prior to joining the SunGate team, John was on the finance and administration staff of a large NGO in South Sudan. He has a Diploma of Business Administration from Team Institute of Business Management, Kampala, Uganda. Timothy Bendeto is the company’s Chief Technician. He studied his primary and high school in the city of Yambio in South Sudan. He then joined a technical training program in Wau, where he learned to become a solar installation, maintenance, and repair expert. Let SunGate help you with your energy needs with a comprehensive design!